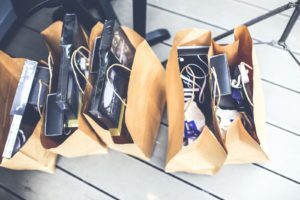 Try throwing a business card into every product bag at an event to get your marketing circulating and encourage people to seek out your business. Business cards are an essential investment. After all, you use business cards to make a first impression, network and even market your brand. But did you know how many creative ways there are to use business cards outside of business networking? Here are ten creative ways to use your business cards this year. Healthcare professionals typically use this idea, but business cards can make a great appointment card for any business meeting. Creating an appointment time and date on the back of your business card can help you network as a store owner, photographer, designer, and more. Business cards aren’t just for networking! Try using your business card to double as a loyalty card. This strategy can help to keep your logo circulating and keep customers returning to your store again and again. Business cards are a great way to get your brand out into the world. Advertise your website, blog, or online profile on your business cards to help drive traffic to your social media campaign. Consider using product packaging that doubles as a business card to bring branding to the forefront of your business. Jewelry such as earrings or bracelets can hang well in a business card, making them great for displays of all kinds. One great way to make the most of all your printing is to use an item like a price tag as an opportunity to promote your business. This way you can encourage the customer to see more products they like on your social media page. Consider using your business cards as a way to run promotions or discounts, such as a referral program. Write a customer’s name on your business card so when they refer a friend who brings the business card back, the original person will receive a discount at your store. By including the prices of your most popular items and services, you can provide customers with an informative card that they can refer to in the future. Business cards are the perfect size for a ticket stub. With fun graphics and the necessary information, you can promote all sorts of events for your business using a unique business card. Business cards make great coupons that will reward customers for visiting your business and promote brand loyalty. Trust FORMost Events & Promotions for Print and Marketing Needs Today! This entry was posted on Friday, March 29th, 2019 at 12:08 pm. Both comments and pings are currently closed.